My 3 month EAPPI term has drawn to a close and I have returned to Canada. Our team left our Yatta house Dec 4. We travelled to Jerusalem for our closing days, joining our EA colleagues from other placements to debrief and to prepare for our travels home. I offer my deepest and heartfelt thanks to the wonderful people of the South Hebron Hills who so warmly and generously welcomed us to their lives and taught us so much, to my teammates Chris, Bosse and Matti with whom I lived and worked and shared this journey together as friends, to our driver Abed who continues to inspire me, and to our EAPPI colleagues who are now this amazing group of friends, scattered around the world. 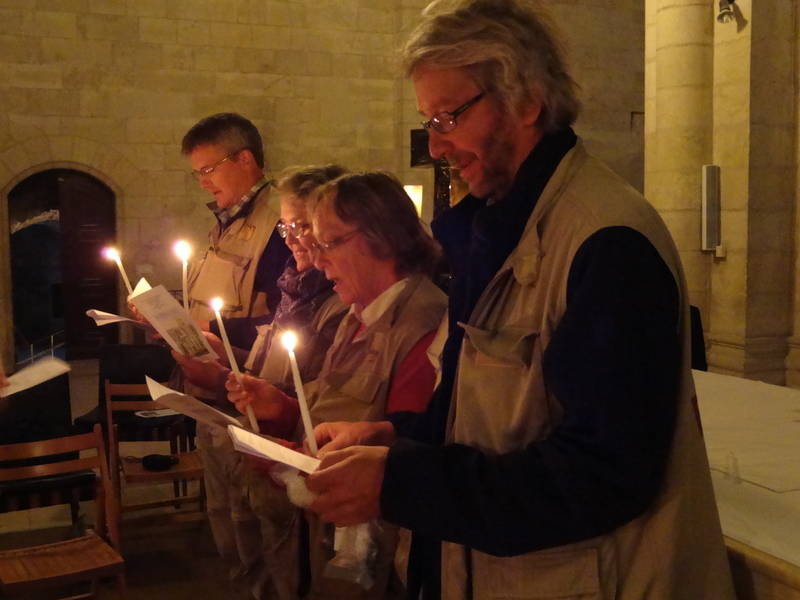 I also thank the World Council of Churches who organize and operate the Ecumenical Accompaniment Programme in Palestine and Israel, and the United Church of Canada who entrusted me with the privilege of serving with EAPPI. I am also very grateful to my family who have been immensely supportive and encouraging, as well as to my friends who have supported me with thoughts and prayers these last months. 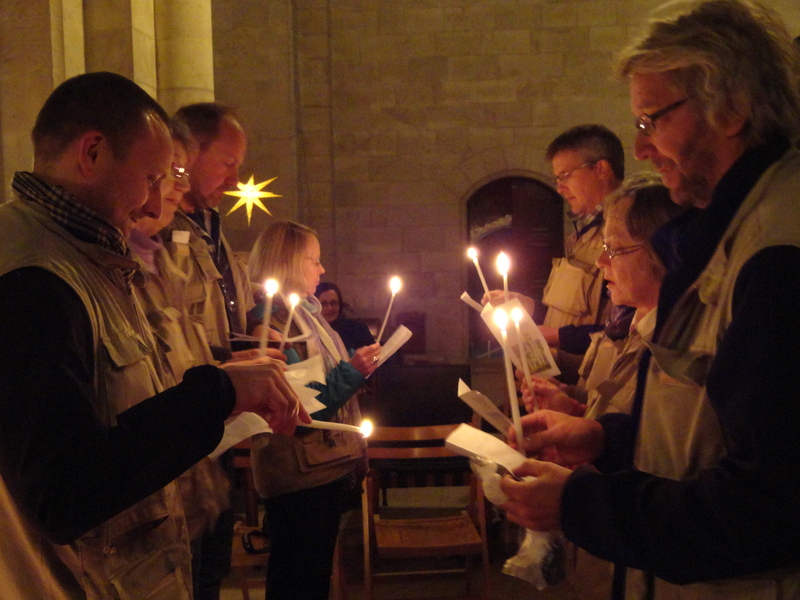 Our EAPPI handover ceremony was held December 5, 2011 at the Lutheran Church of the Redeemer in the Old City of Jerusalem. Outgoing teams from each of the 7 placements handed over our work to incoming teams. Our South Hebron Hills Team 41, comprised of Bosse Johansson (Sweden), Chris Cowan (USA), Matti Marjamaki (Finland) and myself handed over our work in the South Hebron Hills to the capable hands of the incoming team of Rosamond Robertson (Scotland), Kristoffer Eriksson (Sweden), Eva Marie Morf (Switzerland) and Terje Stenholt (Norway). I have every confidence that they are, and will continue to do, a superb job of continuing the work of EAPPI in the South Hebron Hills. As they carry on in this work, I offer them my prayers and support. 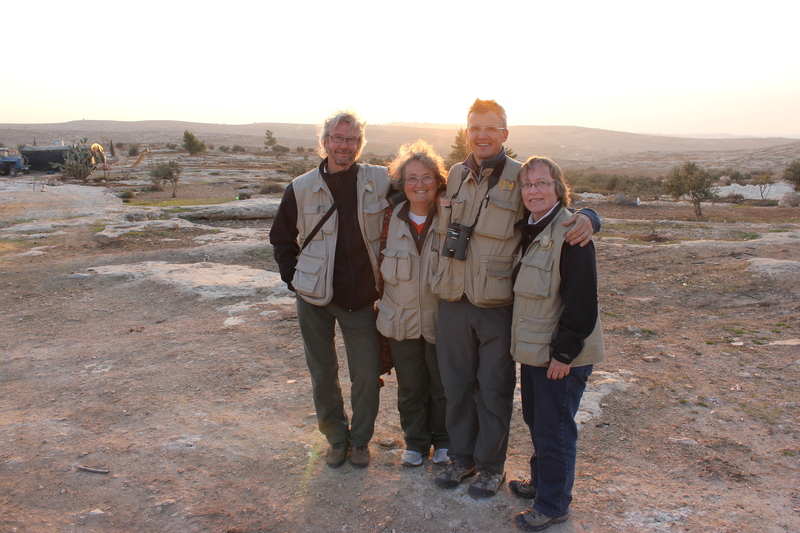 EAPPI South Hebron Hills Team 41 (L to R) Matti Marjamaki (Finland), Chris Cowan (USA), Bosse Johansson (Sweden), Jan McIntyre (Canada). Friends forever!! Team 41 (R) handing over to Team 42 (L) Team 42 members (L toR) Kristoffer, Eva Marie, Terje, Rosamond. I returned to Canada Dec 8, a few days earlier than originally scheduled. My mother was diagnosed in November with acute leukemia and it was important for me to get home as soon as I could. Since arriving home, we have been able to arrange palliative care for Mum and to spend precious time together. It is a gift to be here with her. Our entire family from Manitoba were able to come to Ontario for Christmas. It was so good to be able to finally see them all, and to share Christmas together with Mum and our other family here. I hope to be able to return to Manitoba in the near future. It is interesting how our hearts can be in more than one place at a time. While I am back in Canada and fully present with family, much of my heart is also in Palestine. One cannot spend 3 intense months there and not be changed by the experience. There are still so many stories to tell, and still so much information to share. While we were in Palestine, there simply was not enough time in the day to write as much as I would have liked. I also know that as time goes on there are, and will be updates to stories I have written that need to be told. I look forward to continuing to share these stories with you over the next months through this blog. For now, however, my primary focus switches to family and to my mother, to whom I owe so very much and love so dearly. Along with other family members, I will accompany her on this part of life’s journey. Jesus lived his life reaching out in love to others, advocating and acting for justice and peace. As followers of Jesus, we too are called to that same way of living. Please, please, please use the information you have learned in this blog to further educate others about what is really happening in this long and painful conflict. Unfortunately, our news media either choose not to report this story, or to report it inaccurately, with gross and very hurtful exaggerations, deceptions and distortions. Please, please, please advocate as strongly as you possibly can for an end to the Israeli Occupation of Palestine. It is an Occupation that has gone on far too long. It is an Occupation that is crushing the lives of the Palestinian people, while also hurting the souls of the Israeli’s. Both peoples deserve far more. Canadian Thom Davies is currently serving on behalf of the United Church of Canada with EAPPI Team 42 and is placed in Yanoun. Within the last week, his team has attended a Palestinian community that has suffered two attacks from nearby settlers. What does that mean? It means that their village was attacked on two separate nights by a mob of between 40 and 200 armed and masked people dressed in black. Their homes were stoned, windows were broken, vehicles were destroyed. Their people were terrified and they are suffering from obvious emotional trauma. Two pregnant women were hospitalized and one was delivered by caesarean before the next morning. Rather than coming to the aid of the villagers, the IDF (Israeli army) protected the settlers. Thom reports the testimony of one of the villager’s, a 48 year old father of 7 children aged 4-21, whose home was damaged in the attack. Part of it reads: “the night of the attack, the people near our house had guns, the others broke up into two groups, one with rocks and one with stones, and some had dogs. There were flying checkpoints in our village that night to keep our friends away. There were 50 soldiers who protected the settlers with light bombs, sound bombs and tear gas. When the settlers ran away the soldiers came from both sides. The problem is not the window, I can buy a new window. The problem is I live here, this my home, my family, my children.” This man and his family have lived in this place for hundreds, if not thousands of years. Some of his land has already been stolen from him by these illegal settlers. They obviously want more. He and his fellow villagers are hated for their mere existence and for their persistence in remaining on their ancestoral land. These, and the stories you have read in “A Mosaic for Peace” are not fiction. They are absolutely true. They are not occasional incidents. They just happen to be the stories that we have been present to. The sad, but true reality is that these kinds of atrocities happen frequently throughout Palestine to innocent Palestinians. This is part of the pain of the Israeli Occupation. Write letters to the editor of our newspapers. Participate in focus groups and groups working towards justice. Contact your elected representatives, asking them to hold Israel accountable for the hurts they are intentionally imposing upon the Palestinian people. Israel’s documented refusal, both through words and through actions, to adhere to the Geneva Conventions, to the rulings of the International Court of Justice,to multiple UN resolutions and the Oslo Accords cannot continue to be ignored by the world. Like other nations, they too must be held accountable for illegal acts. Our Palestinian brothers and sisters are counting on us to raise world awareness to the injustices, pain and atrocities that are being regularly inflicted upon them by this Occupation, to tell the world of the humanitarian suffering they are enduring that is directly related to this Occupation. There are many Israeli’s who feel the wrongness of this Occupation and desperately want it to end. It is up to us, those of us who know what is happening, to speak loudly and to speak clearly on behalf of justice, on behalf of peace and on behalf of those who are oppressed and cannot speak for themselves. The power of knowledge is the power to act. People often say, and perhaps believe, that they have no power. That their voice doesn’t count. They wonder what point there is to getting involved? My response is to first remember that we are fortunate enough to live in a democracy and that each person does count, and then to think about the cumulative action of people working together. If each person reading this blog could summons up the courage to take just one action towards helping to resolve this conflict, think of the change that could happen. Then think of the exponential effect that would happen if each person could engage just one other person in the issue, and so on. Real change happens first at the grassroots level. I invite you to become part of the solution. I also invite you to pray. Prayer is a natural part of our living, vital relationship with God. Regardless of our circumstances, regardless of our resources, it is something that we all can do. Perhaps you would like to become part of the Sabeel Wave of Prayer, a weekly prayer chain that encircles the globe. You can become part of it by filling in the form at http://www.sabeel.org/waveofprayer.php and each week you will receive a message in your inbox updating you with the current week’s prayer. Perhaps you can encourage your congregation to become engaged in the issue and to pray regularly for an end to this painful conflict. Perhaps you would prefer to pray in private. The choice is yours. But as people of faith, prayer is an indispensable part of our lives. Please pray for those affected by this conflict, and please pray for peace for all in this troubled land. Thank you for your interest in my Palestinian and Israeli experience. Thank you for being part of this mosaic for peace. I am astounded by how this mosaic has grown and how it has touched and been touched by so many lives, all of whom contribute in their unique way to the ongoing action of peace building and peace seeking. Only now do I begin to realize how this mosaic is but a small, though important part of the much greater mosaic, in which the Divine is ever present. The journey is ongoing. I will continue to use this blog to update stories and information as it becomes available. As we all move forward, learning, taking steps to enhance awareness, to empower others, praying and taking action towards achieving a just and lasting peace for the Israeli and Palestinian people, the mosaic of peace grows. As our Palestinian friends taught us to say in Arabic, Alhamdulillah. Praise be to God. Dear Jan,Glad you are home in Canada,but sorry about your mum’s health. We are so thankful for what you have shared with us about your visit to PalestineWe will try to do what we can. Thank you for your faithful witness and your ongoing story-telling and truth telling. I look forward to sharing with you, on your return to Manitoaba, the experiences we have had and building the network of advocacy in this province. Peace, Salaam and shalom to you as well,, my friend. Hello Jan, Thank you for all the articles, for everything. I will be giving an update to my church soon and with your permission I would like to use this article as part of my entreaty to them to be part of a solution. Best of everything and blessings to your mother and your family during this time of change for all of you.